Luke Clausen remains the only angler to win the FLW Forrest Wood Cup in his rookie season. Hot Seat: In our continuing series, we sit down with different pros and go through their tackle selections for each day of the tourney, one at a time. Today, we sit down with Luke Clausen, one of only five anglers to win both the FLW Forrest Wood Cup and Bassmaster Classic. 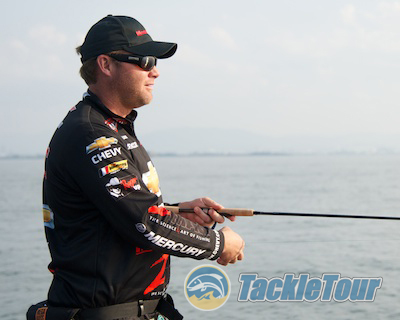 Clausens sponsors include Chevy, Gamma Fishing Line, Megabass, Mercury, Recoil, Tuf-line, and Zman. 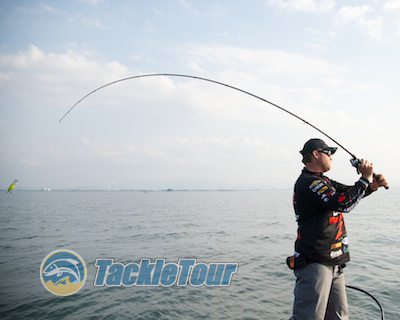 We sit down with Clausen to discuss our imaginary tournament and how he'd approach it during a recent trip to Lake Biwa, Japan. Testing a prototype stick he can't yet talk about, Clausen loves throwing the Deep Six and Deep X 300 cranks from Megabass. 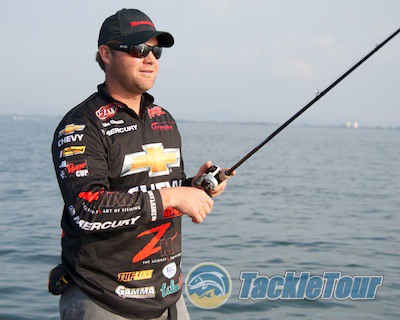 When looking for a cranking stick, Clausen recommends a rod with a nice, moderate taper. L.Clausen: You know, depending on the timing of your tournament, I'd want to fish this new stick we're working on through the Megabass STW program, but I probably can't talk about it yet, can I? Failing that, I suppose I'd rely on the Megabass F4.5-711GTA Ultimate Cranking Stick. I want something long with a nice, moderate bend so it loads deep into the blank on a cast and I can really launch a crank like the Deep Six and Deep X300 as far as I need to. Together with that moderate bend, the rod Ultimate Cranking Stick has a nice soft tip so it doesn't pull the bait away from the fish when they bite it and loads properly once the fish is on. I'm using a nice, slow 5.1:1 gear ratio reel and Gamma Edge ten pound fluorocarbon. I like fluorocarbon for the fact it sinks so you can get the bait a little deeper but also for its sensitivity. Fluoro has a little bit less stretch than mono, but it's also more sensitive. I'd rather have a more limber rod and a line with less stretch than a line with more stretch but less sensitivity. 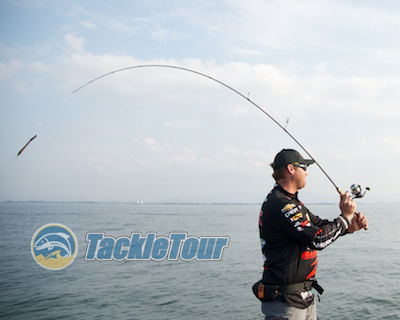 Clausen's number one choice for an all around soft plastics stick is the F6-70XX Tour Versatile. 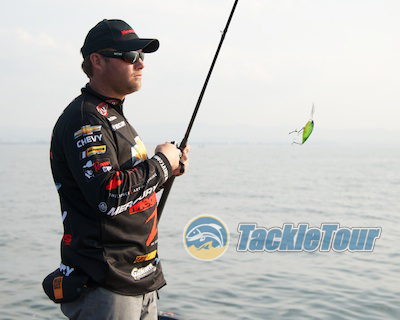 When Clausen goes finesse, he's fishing the Orochi Double X F3.5-70XX Shakey Head stick. 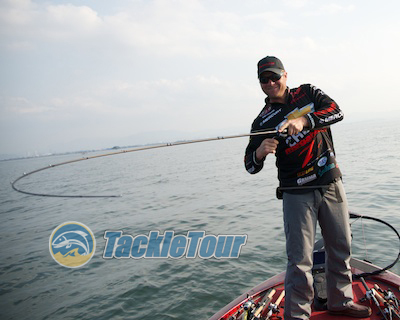 L.Clausen: Probably my number one all around soft plastics rod is the Tour Versatile, Double X F6-70XX. It's just a very versatile rod as it's named. I throw that rod probably more than anything with sixteen pound Gamma Edge Fluorocarbon. With creature baits, lighter duty soft plastics anywhere from three sixteenths (3/16) to three eighths (3/8) of an ounce weighted baits like the ZMan Palmetto Bug, this is a great rod pitching and casting. I'm using fluoro in my general purpose soft plastics rod because I feel you get more bites than with any other line. If I'm going to go with something heavier, like a flipping rod I really like the Aaron Martens Flipping Special, F8-79XX again in the Double X lineup. I really like this stick for pitching and flipping around cover. I'm rigging this with anywhere from a half to one ounce tungsten weight and sixty five (65) pound Tuf-line Super 8 Braid. I'm using braid, of course, in these heavy cover situations for the overall strength. When you're looking for a rod to fish soft plastics with, it's very important they have enough tip to load so you can accurately present your bait. You need to be able to get enough speed on your lure to get it where you want it to go, but enough tip in your rod (even an F8) to slow it down for that nice gentle entry. The Shakey Head stick is more versatile than the Drop Shot allowing you to fish heavier baits while still soft enough to not break off light line.